1. Difficulty – let me build in peace! Difficulty in a game can come from two sources. In many (most?) games, from Shogun 2 to Dark Souls, the primary challenge comes from trying to make progress or avoid failure. If the Game Over/You Died screen is a constant companion, then we can say the game is “challenging”. However, even when the player is not at risk of game-ending failure, difficulty can still arise from self-imposed goals. If the game requires skilful play in order to meet those goals, then this is another form of challenge. When it comes to city-builders, I’ll take the second type of challenge over the first. To me, these titles exemplify gaming as a “narrative of continuous progress”, and as such, I prefer them nice and relaxing. Oh, it’s one thing to have failure lurking in the background. The fear of failure keeps players on their toes – training enough heroes to fight off monsters in Majesty, building apartments and clinics to prevent an uprising in Tropico 4 – but as far as I’m concerned, actual game-overs should be easy to avoid. And in this regard, Tropico 4 is perfect for me: with the default settings, it takes a lot of doing to lose a sandbox game. Instead, I like to see how effectively I can develop the island of Tropico (thriving economy, good healthcare, clean environment, educated populace, etc) within the constraints of money and time. After finishing five or six sandbox games, most as a benevolent leader and one as a brutal kleptocrat, I think I’m done with this play mode, but it was a lot of fun while it lasted. And there are options for players who want more or less of a challenge, ranging from a weaker/stronger world economy, to a more or less fractious populace, to a de facto god mode. The important thing is, I can tailor the game to meet my preferred play style. Uninspired video game settings are a subject I’ve bemoaned before. How many generic high fantasy, WW2, or science fiction games do we really need? Luckily, Tropico 4 bursts with character. There’s a sense of place, of course – cheerful Caribbean music accompanies you throughout the game; your island’s key products include pineapples, papayas, sugar and rum; Tropicans speak in Spanish when you click them; and you attract tourists to your island with promises of sun and surf, plus booze for the spring-break crowd or native ruins for the eco-tourists. But there’s more than that. 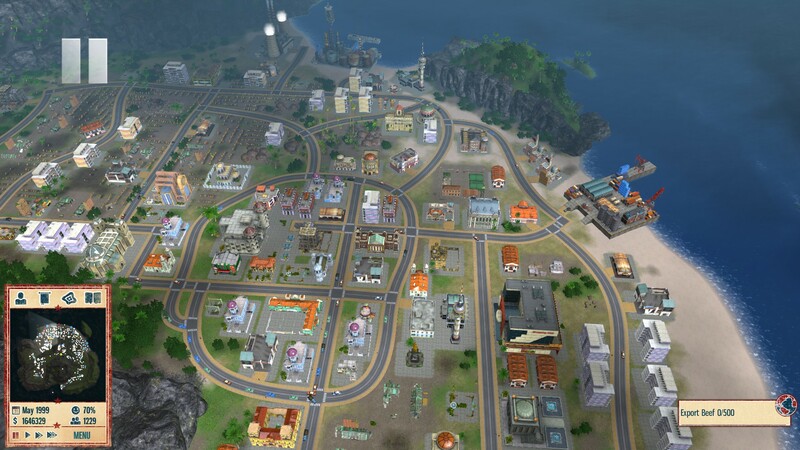 Almost from the get-go, Tropico 4 is also defined by its – usually black – sense of humour. After clicking past the main menu, the first thing you’ll see is a loading screen, emblazoned with an irreverent (“Politicians are the same all over – they promise to build a bridge even where there is no river.”), bleak (anything from Augusto Pinochet), or, occasionally, off-the-wall (“If surviving assassination attempts were an Olympic sport, I would win the gold medal.”) quote. And that cheerful cynicism permeates the entire game. 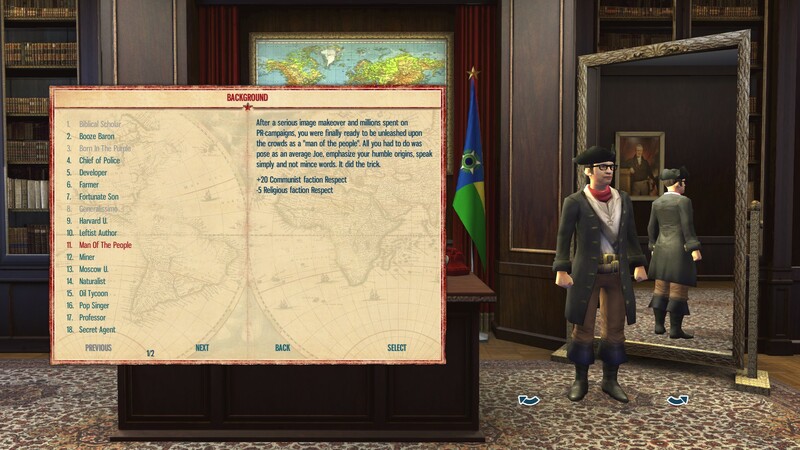 It’s visible in the choice of traits for El Presidente – the screenshot above shows what the game thinks of “men of the people”. It’s visible in the flavour text for almost every action you take; my favourite is the ethnic village, an utterly bogus tourist trap that you can still show off via a “Geographic TV special”! And it’s visible right to the very end of the game, where one of the objectives on the scoring screen is filling the Presidential bank account. (The game doesn’t stint on ways to go about this. Embezzlement? Artifact-smuggling? Taking kickbacks on construction projects? All of the above?) It’s not the most heartening humour, but it’s distinct. 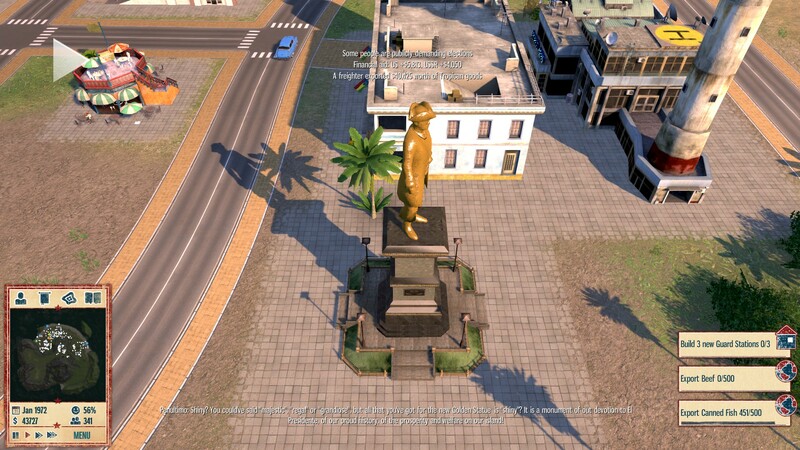 By no stretch of the imagination is Tropico 4 a serious political or economic simulator. But as goofy and abstracted as it is, you can still see the bones of real-life policies embodied within its systems. My favourite example is the game’s economic model. Almost all businesses on Tropico are owned by the government, and the only tangible goods consumed by Tropicans are food and imported luxuries. (They do, however, consume a wide array of services.) As such, almost everything to come out of a Tropican farm or factory goes straight to the export market, the resulting dollars go straight to government coffers, and the reverse is true – imports deplete the government’s pocket. 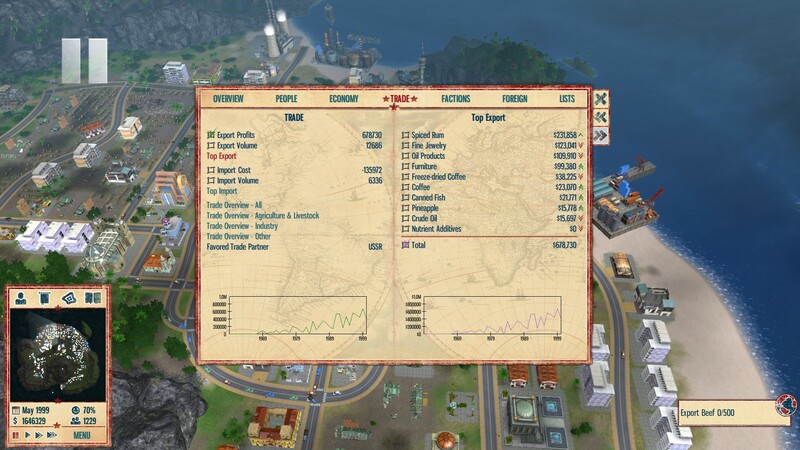 Making trade surpluses the main source of government income – there are no taxes on Tropico – is quite the abstraction! However, the net effect is to encourage the player to pursue mercantilism, encouraging exports while minimising imports of consumer goods*. Specifically, it encourages the player to focus on exporting manufactured goods, since these are far, far more profitable than raw materials. In other words, the game effectively leads you down the path of export-led growth pursued by such countries as post-WW2 Germany, Japan, Taiwan, Korea, and of course, China. While this is almost certainly a coincidence**, it’s still a thrill to play the game and realise I’m re-enacting a page out of modern history. Other aspects of gameplay echo our world. Tropico’s education system isn’t just opiate for the masses – it takes a skilled labour force to operate those factories. (“Skilled”, in this context, meaning “high school educated”. I do wish the game offered more high-end export jobs for university-trained workers.) Building, then subsidising, apartments banishes shanty towns, which are both unsightly and bad for the people’s morale. This even extends to the superficial: one of the game’s silliest white elephants is a rotating golden statue of El Presidente (pictured above)… which happens to be lifted from real life. For folks with an interest in nation-building (or nation-ruining), Tropico 4 can feel like a basket filled with Easter eggs. If I had to pick just one of the above strengths as a stand-out, it would be #3, seeing elements of real life reflected in the game. Just as there’s a joy in “reaching out to touch history” when playing Europa Universalis 3, so there’s a joy in reaching out to touch issues that could have come from the pages of a newspaper, or an interview with a statesman. But this is not to take away from the game’s other strengths. I laugh at its building descriptions and silly radio conversations, and settling down to develop my island in sandbox mode has been a pleasant, satisfying experience. Tropico 4 won’t hold my interest forever – I’m now ready to move on from the sandpit, either to the campaign or to another title. But even after I shelve the game, I may well read an article on postwar development months or years from now, look back, and smile when I remember my stint as leader of a Caribbean Tiger. * Except for food. In-game, it’s often more efficient to export cash crops and manufactured goods and just import relatively cheap food. ** Supply-chain management is part and parcel of the city-builder genre, and manufacturing has been a path to virtual riches at least as far back as Colonization.